Most people have certain Web sites that they check each time they open Internet Explorer to go online. 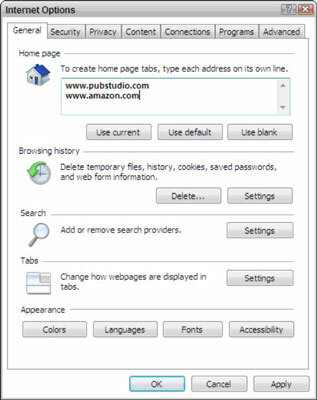 You can change your home page in Internet Explorer so that every time you launch it, it opens to the same page or pages. The home page can be a corporate site, a port (like Google), your Facebook page, or even your personal Web site. Open IE and choose Tools→Internet Options. The Internet Options dialog box opens. Click the General tab; enter a Web site address or addresses that you want to appear whenever you go online. 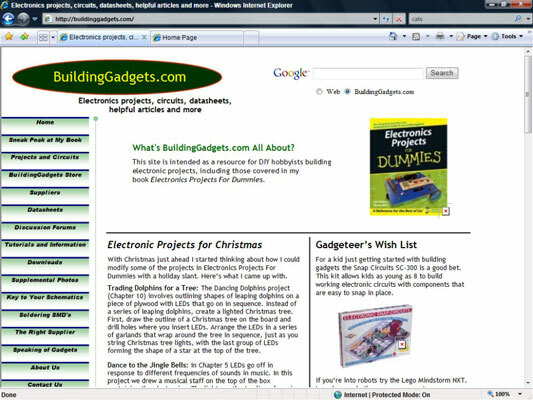 Note that you can enter several home pages that will appear on different tabs every time you open IE. Alternatively, click one of the buttons in the Home Page area below the text box. The following option buttons allow you to set the home page without having to type the URLs. When you click one of these buttons, it replaces any Web page or pages that are currently set as your home page. Use Default: Sets your home page as the MSN home page. Use Blank: If you’re a minimalist, this setting is for you. No Web page appears; you just see a blank area. Click the Home Page icon to go to your home page. To remove a home page you have set up, click the arrow on the Home Page button, choose Remove, and then select a particular home page or choose Remove All from the sub-menu that appears.